Chris Lee joined the Deseret News from his position as the CEO of Heritage Makers, a privately held seller of Web-to-print products. He has held key leadership roles in several new media companies, including serving as director of business development at Ancestry.com and director of product management for MyFamily.com, a social network for families. He began his career with Monitor Group, a global innovation and strategy firm. 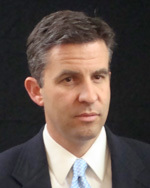 Chris holds a bachelor's degree from Brigham Young University and an MBA from Harvard Business School. Chris Lee, V.P., digital, The Deseret News, started at the newspaper in 2010. Lee says The News is now a “web-first” news organization. Lee says the key to success in his job is “the ability to change, to embrace change … and a willingness to keep changing.” “People who can navigate those changes will have an opportunity in this industry, and lots of other industries,” says Lee. Chris Lee, V.P., digital, The Deseret News, says The News is skeptical about erecting a pay-wall around its website. “‘Content’ generally ‘wants to be free,’” says Lee, meaning the public wants free news. The newspaper industry “needs to be patient as [digital] CPMs grow,” according to Lee. Since The Deseret News is owned by the LDS Church, Lee says, “We also see us as having a little mission and see our content as something valuable to add to the world, and reach and influence is as important to us as revenue.” Like his colleague, Clark Gilbert, Lee also sees a future for printed newspapers. “We see print as having a long life left,” says Lee. Both Lee and Gilbert expect the print circulation for The Deseret News to grow over the next few years. Chris Lee, V.P., digital, The Deseret News, says keeping costs constrained is critical to the future success of newspapers. The News is following a path supported by their citizen journalists through Deseret Connect. It’s “a combination of remote contributors that are not working fulltime that are paid very small amounts or, in some cases, not paid. And a journalism team [in which] you keep your costs as low as you can: while employing a really great team of journalists. It’s a really delicate balance to keep,” says Lee. Lee is also convinced the “top-down model” won’t work in journalism anymore. Readers want newspapers to “tell us what we want to know in a frame of reference that you are upfront about and that we can trust,” says Lee.